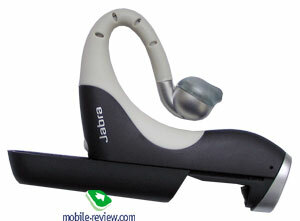 Jabra has been gradually trying to cover new market segments and offering low-end solutions plays rather a large role. In difference to other Asian manufacturers the company showed its best in the European market and that's why its products do attract attention. A model called BT110 is a compromise between working time, weight and, of course, the price of the product. As that's well known power supply takes up to 1/3 of the price and the manufacturers try to combine various sources. For instance, Li-Pol batteries were used in the first headsets. But as the practice proved, using them in frost leads to a bad end and going to a service center. That's why in the later models Ni-Me batteries that are morally out-of-date were applied. Li-Ion batteries are those intermediates and are used in such devices most often today. One of the key problems for a bluetooth headset is changing a battery after one or two years of work. Creating a removable panel and allowing the access to the battery decreases the reliability of the device (if we speak not about stationary headsets). And as a rule a manufacturer tries to avoid this. Changing a battery in a service center is not always well-taken and it seems better to buy a new headset. For low-end products the problem was solved by using usual power supply and in particular AAA batteries. 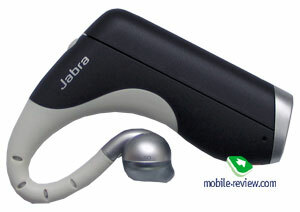 Jabra BT110 is an example. Evident advantages are no need in recharging the battery, wide-spread power supply type (it may be bought almost everywhere). 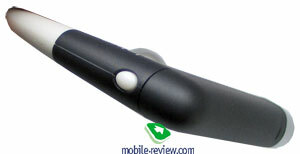 And disadvantages are also evident, the weight increases for a battery weight and the headset is not miniature any more. The most evident solution is used in BT110; the power supply is hidden into a vertical box that is placed behind your ear. Pulling its external part is enough for opening the box. The catch has no backlash and that is an advantage. 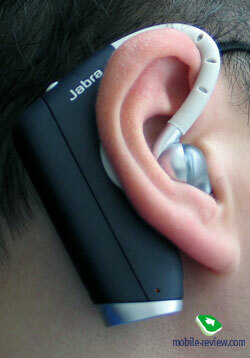 The part of the device disposed behind your ear has a soft holder and makes no load for your ear. The earphone is equipped with a silicone cover and there are three of them in a package. Wearing the headset makes no problems since its weight in an equipped mode is 26 grams. Spending the whole day wearing the headset is hard but several hours are quite possible. There are only two control elements on the headset. A volume level button is on the top (the values are disposed in s cyclic order, four volume levels totally) and an answering button that also activates voice dialing in on the bottom. Working with a bottom button makes no problems but you'll have to get used to and thus working with the top one seems easier. 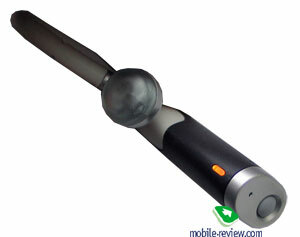 There is a light indicator on the bottom end of the device and it seems to be more useful for people around than you. A microphone is also in the bottom placed behind your ear, at the same time the majority of miniature headsets have it directed towards your mouse. The main fear was roused by the voice transmission quality due to that non-traditional disposition of the microphone. At first sight the fears were disapproved, the headset worked well in a car, indoors and outdoors. The interlocutor hears your voice rather well; the only "but" is that everybody noticed the voice sounded unnatural like speaking through a cotton wool. Testing the headset in a group of users gave new food for discussion. The quality of voice transmission fully depends on its timbre. If one speaks loudly but his voice is not an average statistical one it will be heard badly. Those ones who have high or low voice (or even an overtone) won't be able to use BT110. That is where some complains appear and the opinions on its quality start to differ. As for me, the easiest way is to try the headset when buying. I'd like to note that due to the microphone disposition you'll need to speak louder than average. Hearing your interlocutor won't make problems and everything is traditionally well here. By the way you may adjust the loudspeaker volume. 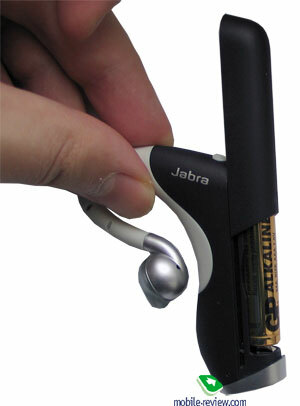 The headset is detectable for three minutes after you have placed the battery in. The standard supported is bluetooth 1.2. Working time is about several days (in our case it was about 5 days with 15 minutes of talks a day). Working time may rise if using qualitative alkaline batteries. The absence of a Mute function disappoints but it's hard to be found in a device of this class. The headset costs about 90 USD and that is not a suitable price for a low-end model (there are ones with the price of 35 USD). The device will be considered a low-end one when the price falls to 45-50 USD and then it will surely be interesting to users. 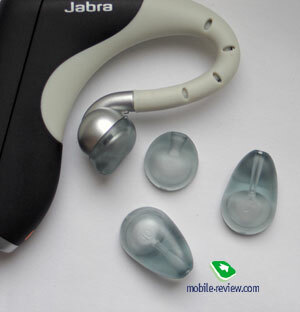 Those looking for the quality of voice transmission and work in the maximum number places should pay attention to elder models of Jabra product line. This product is not bad but it is a niche one in some kind (though it would seem everything should be differently). When speaking about a narrow audience we mean the growing number of offered models with better functionality and a falling price. Against their background BT110 differs in a qualitative assembly and a famous brand name. But such manufacturers as SouthWing with its NeoVoice get closer on the heels, the story repeats. We are grateful to Betalink for the provided devices.